In this application protocol, we describe the pre-enrichment of lineage marker-negative, bone marrow-derived cells, and their phenotypic analysis using flow cytometry. PBE buffer: Prepare a solution containing phosphate-buffered saline (PBS), pH 7.2, 0.5 % bovine serum albumin (BSA), and 2 mM EDTA by diluting MACS® BSA Stock Solution (# 130-091-376) 1:20 with autoMACS® Rinsing Solution (# 130-091-222). Keep buffer cold (2−8 °C). Degas buffer before use, as air bubble could block the column. ▲ Note: Use the Direct Lineage Cell Depletion Kit for a high cell yield, or the Linear Cell Depletion Kit for a more stringent depletion. (Optional) Fluorochrome-conjugated antibodies for flow cytometry analysis, e.g., Anti-Biotin-APC (# 130-090-856), CD117-PE (# 130-102-795) or CD117-APC (# 130-102-796). For more information about antibodies refer to www.miltenyibiotec.com/antibodies. (Optional) Propidium Iodide Solution (# 130-093-233) or 7-AAD for flow cytometric exclusion of dead cells. (Optional) Dead Cell Removal Kit (# 130-090-101) for the depletion of dead cells. (Optional) Pre-Separation Filters, 30 µm (# 130-041-407) to remove cell clumps. MACS Columns and MACS Separators: Choose the appropriate MACS Separator and MACS Columns according to the number of labeled cells and the number of total cells. Use autoMACS for automated magnetic cell separation. ▲ Note: Use LS Columns for the Direct Lineage Cell Depletion Kit, mouse. The kit can be additionally used with the MultiMACS™ Cell24 Separator Plus, and includes a completely automated cell isolation protocol for use with the autoMACS Pro. cells remain unlabeled. Depending on the target cell frequency, the labeled fraction can represent the majority of the total cells. To avoid blocking of the column, do not exceed the maximum number of labeled cells per column. Estimate the number of labeled cells in the sample, split the sample if necessary and use the appropriate number of separation columns. ▲ Note: If separating with LS Columns and the MultiMACS Cell24 Separator Plus, use the Single-Column Adapter. Refer to the user manual for details. PBE buffer: Prepare a solution containing phosphate-buffered saline (PBS), pH 7.2, 0.5 % bovine serum albumin (BSA), and 2 mM EDTA by diluting MACS® BSA Stock Solution 1:20 with autoMACS® Rinsing Solution. Keep buffer cold (2−8 °C). Degas buffer before use. Isolate mononuclear cells from bone marrow extracted from mouse femoral bones. ▲Note: All steps should be performed on ice cold PBE buffer (see "Things to prepare in advance"). Extract mouse limbs and place on cold PBE buffer. Use sterile scissors and forceps to isolate femoral bones. Place them in a 6 cm cell culture dish with 2–3 mL ice cold PBE buffer. Isolate bone marrow cells either by grinding isolated femoral bones in a mortar or by flushing the cells out of the bone with a syringe. Pass cells through a 30 µm MACS® SmartStrainer into a 50 mL centrifuge tube to remove cell clumps that can clog the column. Wet the filter with PBE buffer before adding the cells. Adjust final volume of cell suspension to 15–30 mL, depending on estimated cell number. Take 10 µL of cell suspension to determine cell number using a Neubauer chamber or another cell counting device. Store a 200 µL aliquot of the cell suspension on ice for later flow cytometry analysis. Centrifuge the 50 mL centrifuge tube containing the isolated bone marrow cells at 400×g for 10 minutes. Deplete cells expressing lineage markers from total bone marrow mononuclear cells using either the Direct Lineage Cell Depletion Kit, mouse or the Lineage Cell Depletion Kit, mouse. The first generates a high cell yield. The latter enables a more stringent depletion. Follow the protocol of the corresponding kit data sheet. ▲ Note: Lineage depleted cells can be further enriched, e.g., to obtain LSK cells, using fluorescence-activated cell sorting. ▲ Note: We recommend filtering the magnetically labeled cells before separation to guarantee a single-cell suspension either manually or via the automated protocol using the autoMACS® Pro Cell Separator. Isolation of untouched lineage-negative cells from a mouse bone marrow cell suspension. 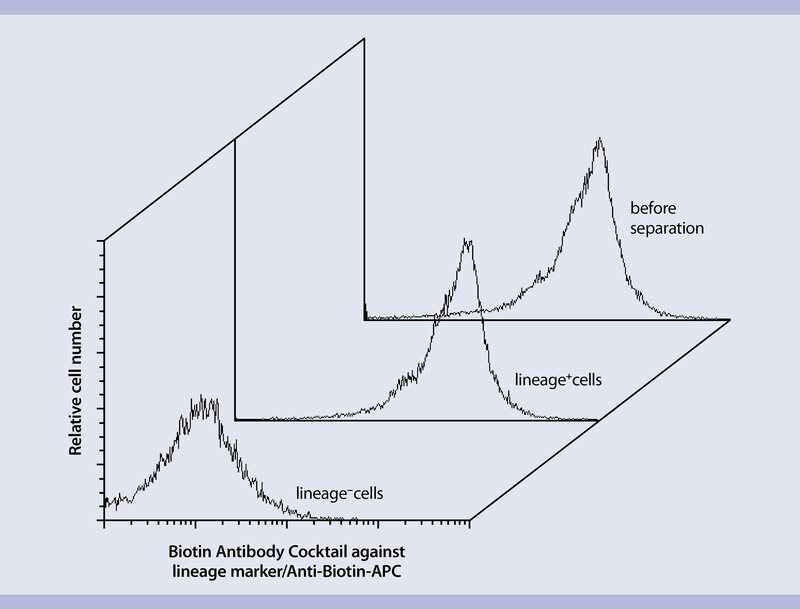 After isolation with the DIrect Lineage Cell Depletion Kit, mouse, lineage-negative cells were fluorescently stained with Lineage Cell Detection Cocktail-Biotin and Anti-Biotin-APC and analyzed by flow cytometry using the MACSQuant® Analyzer. To evaluate the LSK (Lin–Sca-1+c-kit+) fraction, cells were further stained with CD117-PE (c-kit) and Anti-Sca-1-FITC. Cell debris and dead cells were excluded from the analysis based on scatter signals and propidium iodide fluorescence. Clear separation of lineage-negative and lineage-positive cells. Untouched lineage negative cells from a mouse bone marrow cell suspension using the Lineage Cell Depletion Kit and a MidiMACS™ Separator with an LS Column. Cell debris and dead cells were excluded from the analysis based on scatter signals and PI fluorescence. A comparison of the ungated forward scatter versus side scatter profile of the same sample after separation with the CD34 MicroBead Kit or the CD34 MicroBead Kit UltraPure demonstrates reduced debris carry-over with the CD34 MicroBead Kit UltraPure. Isolation of lineage–/CD117+ cells from a mouse bone marrow cell suspension. After depletion of lineage+ cells using the Lineage Cell Depletion Kit, CD117 MicroBeads and a MidiMACS Separator with LS Columns were used to isolate CD117+ cells. The cells were then fluorescently stained with CD117-PE, and a panel of biotinylated antibodies against lineage markers and Anti-Biotin-APC. Cell debris and dead cells were excluded from the analysis. Lineage marker-negative cells can be expanded in appropriate mouse HSC expansion media supplemented with cytokines such as SCF, TPO, FLT-3L and IL-3 and IL-6 according to standard cell culture protocols. 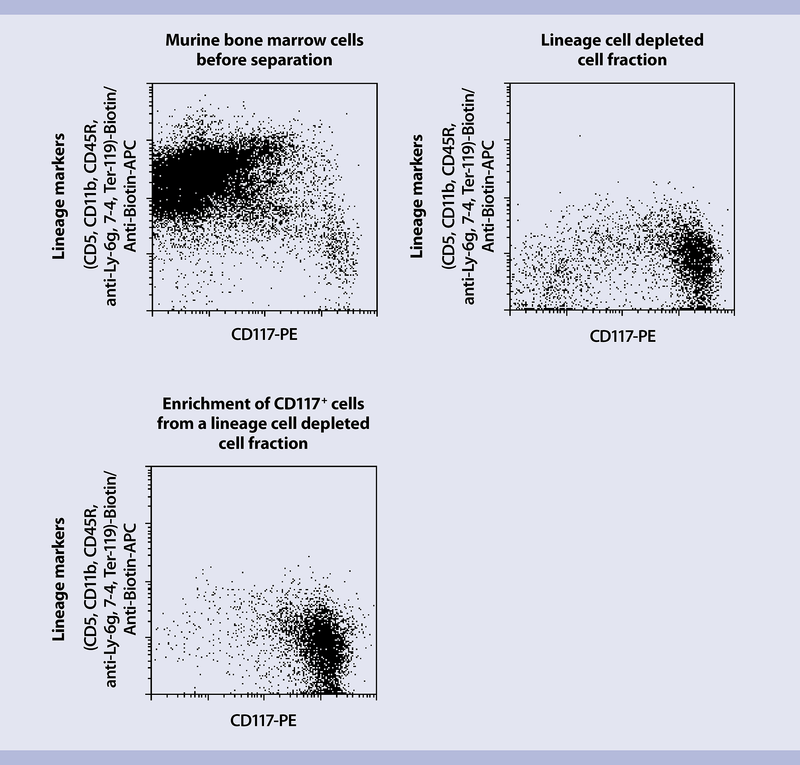 Lineage marker-negative cells can be further analyzed or sorted for HSC-specific surface markers by flow cytometry using MACS® Antibodies or recombinant engineered REAfinity™ antibodies. If cell separation was performed with the Direct Lineage Cell Depletion Kit, mouse, use Labeling Check Reagent-APC for the flow cytometry analysis. For separations performed with the Lineage Cell Depletion Kit, mouse, use Streptavidin-APC. Use the MACS Flow Cytometry – Multicolor Panel Builder to quickly assemble the antibodies for your analysis. Centrifuge aliquots of the different cell fractions (original, positive and negative fractions) at 300×g for 10 minutes. Resuspend each cell fraction in 100 µL of staining cocktail. Carefully pipet the suspension up and down. Incubate the resuspended cells at 4 °C for 10 minutes. Add 100 µL PBE buffer to each cell fraction and mix thoroughly by pipetting up and down. Centrifuge cells at 300×g for 10 minutes. Resuspend cell fractions in 200 µL PBE buffer for flow cytometry analysis.